How do copyrights work? It's always better to simply give credit to an author any time you use someone else’s work, even if you are not required to. This may not only help protect you legally from being sued for copyright infringement, but it shows you're a professional who practices good business ethics. The de minimis principle is the legal term that describes issues that may seem big to an individual but aren't, necessarily, under the law. Essentially, it means “Some things are just too small to be bothered with.” This principle applies to many areas of law, including copyrights. Whether or not something is specifically subject to de minimis interpretation is entirely up to a court of law, so it's important to talk to an attorney before heading off to court. While it can be said, “the little things in life matter,” this isn't always true when it comes to copyright laws. Ringtones created from CDs or other published sources of music are not copyright infringement if the person who creates them only uses them for their own phone and in no way publishes, promotes, or benefits financially from the created ringtone. However, if you seek to share, promote, or profit in any way from the ringtone you created without permission, it's an act of copyright infringement. While laws could change, for now, creating a ringtone from a song for personal use is no different in legal significance than quoting a sentence from a published source, and it's permissible under the Fair Use Act. Some people still believe that simply mailing yourself a sealed envelope showing proof that you created work is sufficient to protect your rights to your own works. This practice is often referred to as the “poor man’s copyright.” It's anything but reliable, and it may or may not offer evidence in a court of law should legal action result from your claim to ownership. The United States Postal Service (USPS) neither requires nor checks to see if an envelope is sealed before it's mailed. Because envelopes can be tampered with and documents can be exchanged, “self-sealed mailings” shouldn't be relied on as solid legal evidence of your copyrights to any form of expression. The USPS doesn't condone self-addressed mail as proof of ownership, and it clearly warns consumers not to use registered or certified mail. If you have something really important to you, of potential or significant value, it's well worth the time and money to protect your interests through formal copyright registration. There are also online resources where you can upload digital images of material to show proof of the creation date. You're then sent email verification with a return copy of your digital image. However, only formal registration can offer you certain legal remedies. If you haven't registered copyright, you can't even sue someone for copyright infringement in the United States. And, if you didn't register your copyright in a timely manner (90 days or less), your right to recover damages in court will be severely limited. You can register a copyright online for $35. Paper applications cost $45 to file. 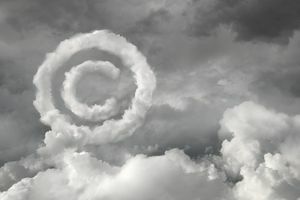 There are many ways you can show something you created has been copyrighted because how you show your work has copyright is more a matter of preference than U.S. law. Sometimes, authors also use the words “All Rights Reserved,” or “All Intellectual Rights Reserved.” Neither is really necessary, as copyright already indicates that your rights are protected. However, an author is not even required to show copyright in order to be able to assert their rights. For example, a signature on a painting is sufficient for the painter to claim rights; the painter does not need to add anything further about copyrights to the painting itself. Music is similar, in that the songs you hear on the radio don't have disclaimers read out loud each time a new song is played. However, many authors do allow you to freely use their works without specific permission. Some don't care and state that anyone can do anything without giving credit, but some require you to show their copyright in a certain format as a condition of use. When using material from someone else, it's very important you honor the author's request as to how they want credit shown. If you don't accurately comply with the instructions, and the use is authorized only if you give credit in a very particular way, you could still be violating someone else's copyrights. What does a copyright actually protect? Paid Sick Leave: Is It Required by Law? Is It Legal for My Employer to Tap My Phone?